(Nanowerk Spotlight) There has been tremendous interest in cloaking technology using metamaterials, and Andrea Alù's group in the Department of Electrical and Computer Engineering at The University of Texas at Austin, has been very active in the field, putting forward two exciting possibilities to obtain drastic scattering reduction from moderately-sized objects. One is the concept of plasmonic cloaking, which the group has put forward in 2005 and following years together with Nader Engheta at the University of Pennsylvania (see for instance: "Achieving transparency with plasmonic and metamaterial coatings"), both theoretically and experimentally, and is based on the use of a thin metamaterial cover to suppress the scattering from a passive object. The second one is the concept of mantle cloaking ("Mantle cloak: Invisibility induced by a surface"), which is based on a simple impedance surface to achieve similar effects. The team's latest findings in ACS Nano ("Atomically Thin Surface Cloak Using Graphene Monolayers") show that even a single layer of atoms, with the exciting conductivity properties of graphene, may achieve similar functionality in planar and cylindrical geometries. "The graphene cloak idea stems from the mantle cloaking concept, which we have proposed at microwaves using frequency-selective surfaces, i.e., properly patterned conducting surfaces that can tailor their effective surface impedance at will," Alù explains to Nanowerk. "Due to the recent progress in understanding graphene's AC conductivity, we have realized that its unique features of ultra-high mobility and largely tunable Fermi level may naturally provide the required reactive properties in a single atomic layer. The effective surface impedance of graphene can be tuned in real-time, another great advantage of this graphene cloak, which makes dynamically tunable and switchable cloaking operation possible." Once realized, this concept represents the 'thinnest' possible cloak, operating in the THz spectrum. 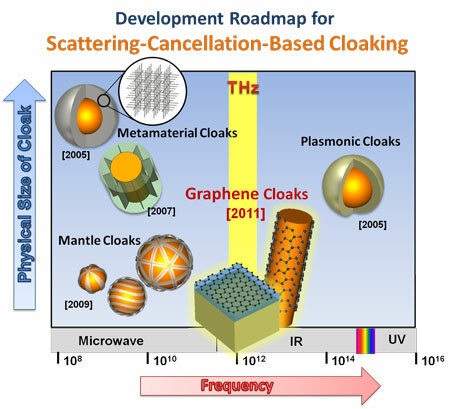 Alù's student and co-author Pai-Yen Chen put together the graphics below to summarize the status of technology of scattering-cancellation cloaks that the group have recently proposed, and where their latest findings fit in terms of thickness and operating frequency. Alù points out that the exciting tunability properties of graphene may also realize real-time tunable cloaks for a variety of devices. "Our results may pave the way to exciting applications in low-scattering electronic components and non-invasive sensors, as we explain in the following" he says. "There is great interest in realizing low-scattering or impedance-matched electronic components, and we believe that the use of this graphene layer may realize this effect in an ultrathin geometry – much thinner than anti-reflection coatings or other available technology." In addition, the operation of the graphene layers may be tuned to some degree at the desired THz frequency in real-time. Alù says that this concept may realize non-invasive IR sensors, which may detect the impinging signal avoiding scattering in any direction, extending the concept of cloaked sensor, which the group has put forward in 2009 ("Cloaking a Sensor"), to infrared and THz wavelengths. "This may be ground-breaking to improve the fidelity of near-field measurements" says Alù. "The sharp tunability of the graphene cloak's response may also be used to realize more efficient and thinner IR switching devices integrated in a monolithic photonic circuitry." Graphene's largely tunable conductivity and its ultrathin properties may be used for a wide variety of applications – not limited to cloaking and invisibility – that scientists currently are only envisioning. Practical integration of graphene within electronic components and biasing is still at its early stages, but the potentials of this technology are very promising. "The field of metamaterials, plasmonics and advanced materials, on which we are active since several years, holds the promise of revolutionizing current technology," says Alù. "The recent advances in the area suggest a variety of new applications, which make working in this area very exciting." This work has been supported by an AFOSR YIP award, by an NSF CAREER award and by an ONR MURI grant.